This is a beautiful app that asks children and adults to enter a magical world of animals in a night time zoo where children are sent on drawing “missions”. 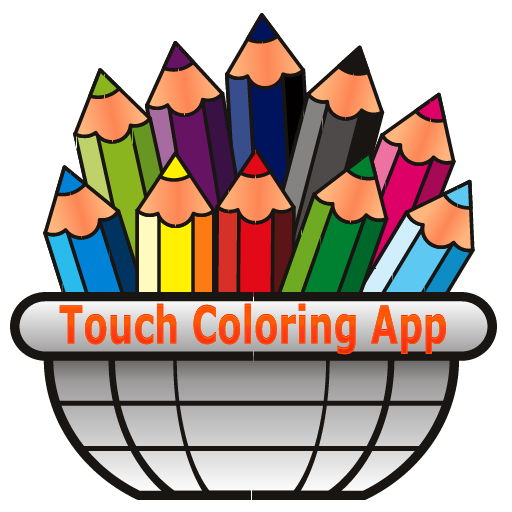 The app is of high-quality, it captures imaginations and pushes children to get in the habit of drawing and writing little stories about their drawings. This is a 5 Star app. Prepare to be “teleported” into a different universe that will challenge your children’s creativity and push the boundaries of their imagination. The app is set within the context of a magical night zoo and its mysterious teleporting zookeeper. 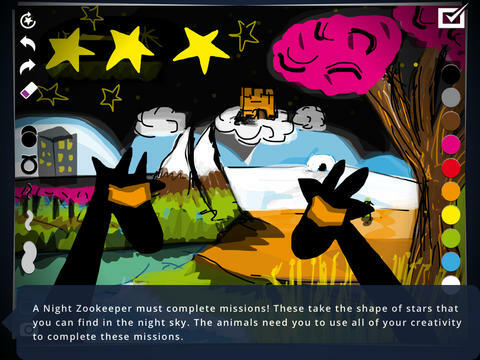 All the children who join the app are called “Night Zookeepers” who must carry out “missions” (or imaginative drawing projects which they can then upload or, “teleport”, to the Night Gallery”. The project is part of a real-life project of the “Night Time Zoo Keeper” team which go into schools to unleash the story and the magical world of the animals that fire up children’s imaginations. Just as with the app, children are encouraged to draw and paint magical animals, hybrids of animals or completely made up animals alongside a small bio or story of each animal. One of the great things about this app is that it keeps children engrossed in the story even when they are not playing. 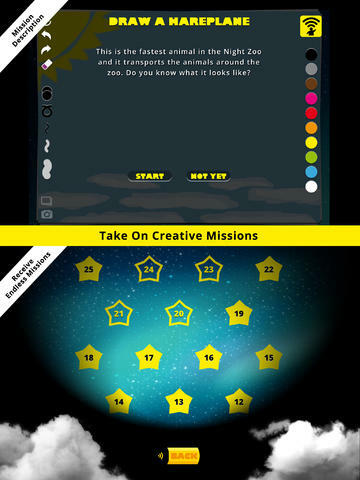 Every day “new missions” are sent to the iPad, to remind children of their tasks. The missions involve drawing a “hareplane”, drawing an outfit for a kiwi, drawing new friends for a goat and drawing the night sky on an elephant. These missions are sometimes sabotaged by invisible monsters who steal the colours and make it more difficult for kids to create the drawings with a limited range of tools and colours. This is a nice little quirk to the app as it gets kids thinking about working with what they have whilst still creating the most compelling drawings. Once the drawing is finished, the user can save the image and then add a short story about the image. This is then uploaded or “teleported” to the “Night Gallery” where parents or teachers can view it on a private online dashboard that can be accessed via web as well as within the app. 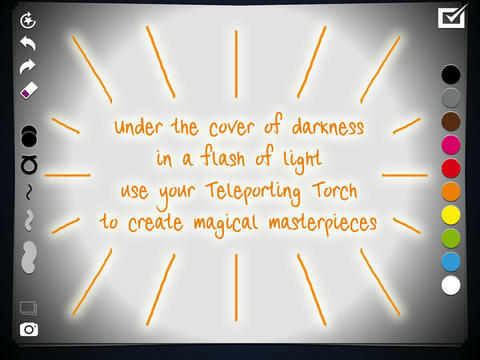 The Night Zookeeper Teleporting Torch comes with a canvas and drawing tools. There are three different-sized brushes, an eraser, and a tool for automatically filling in shapes as you draw them, an undo button and another button for adjusting the sheerness of the colours. Overall, we are very impressed with this app for a variety of reasons. The story of the Night Time Zoo Keeper is very engaging and children’s imaginations really buy into the idea. This means that they will be very keen to use the app and to fulfil the missions or tasks. The missions encourage an active imagination but the stories that can be added after the drawings enhance creative writing, spelling and sentence construction skills. Moreover the “Gallery” or the section where it you can upload the drawings and adults can look into them and then provide verbal feedback to children. Parents and Teachers can even set “missions” for the children. They can add a story and a request for a drawing and accompanying story. This is a nice feature as it means that adults can get involved and continue to spread the magic of the Night Time Zoo Keeper story. Children have Santa Clause to believe in and now they have the Night Time Zoo Keeper too. 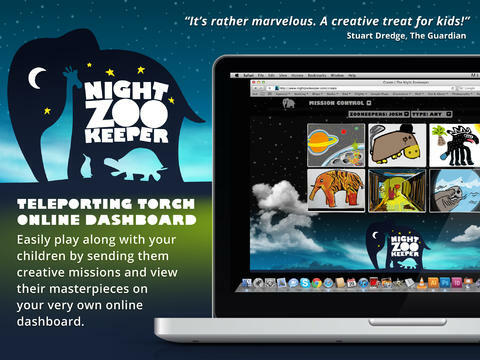 Night Zookeeper Teleporting Torch delivers free daily drawing activities to your iPad. They inspire you to read, draw and write stories about magical animals! Do you think you could become a Night Zookeeper? Enter a world of Spying Giraffes and Time Travelling Elephants to defeat Fear Monsters that stifle creativity. On your journey you will take on creative drawing and story writing missions to protect the zoo from monsters and care for thousands of magical animals. Can you turn one of your friends or family into a strange animal? Could you paint the ocean, if a monster has stolen the colour blue? It's time find out! 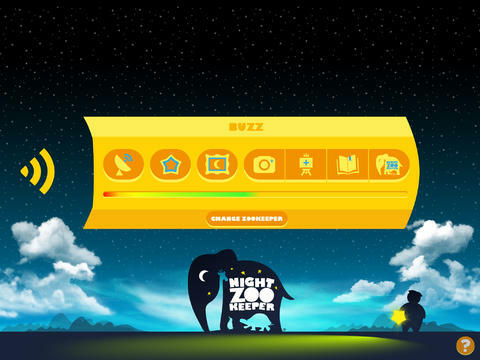 Night Zookeeper is an award winning creative project popular in homes and schools across the world.